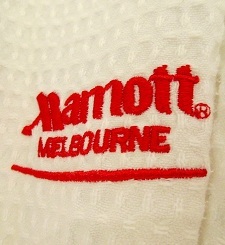 I exchanged Warsaw Marriott for Melbourne Marriott during a stopover in Melbourne as an easy place to adjust the bio-clock, feed the jet lag and get some meetings done before the next trip. I also wanted to check out the results of their latest AUD12 million renovation which I read about in the Marriott newsletter. The hotel received a makeover of its bar and meeting facilities in 2008. The latest renovation is fuelled by the owner's support for creating a more desirable destination for corporate and leisure travellers and a more competitive product in the Melbourne accommodation market. As a business and leisure traveller who spends up to 70 percent of the year living in deluxe-class hotels, the upgraded Melbourne Marriott meets my needs in several aspects. Here are 4 top reasons to stay, work and play at the Melbourne Marriott on your next trip into the city. It's not Pan Pacific in Singapore with its high-tech check in services but Melbourne Marriott works hard at offering guests a high touch experience that is at the heart of the way this 85 year old hotel brand does business. Despite the busy scene of large numbers of conference delegates, checking in at this boutique deluxe-class hotel was painless. Most importantly to me at 8am after a long haul flight was the fact that front office staff were focused on getting me into my room the soonest possible. The good old fashioned service that Melbourne Marriott talks about is exemplified in their little touches, whether you're on business or vacation with the family and kids. Arrivals are accompanied by a glass of sparkling wine and kids receive a gift bag to put an immediate smile on their faces. As a Marriott Rewards member, I received complimentary internet for the duration of my stay. Marriott also invites guests to make memories by uploading their favourite photo taken during their visit. The photo with the most likes on www.marriottmemories.com.au at the end of the month wins a short break in in Marriott properties in Melbourne, Sydney, Brisbane or the Gold Coast. The complete redesign of the hotel's 166 rooms and 19 suites over 10 floors created contemporary-retro spaces that were comfortable for unwinding after a day of meetings or chilling out during vacation in Melbourne. In-room improvements included new carpets, furniture, artworks, 42" flat screen LG High Definition TVs and iPod docking stations. 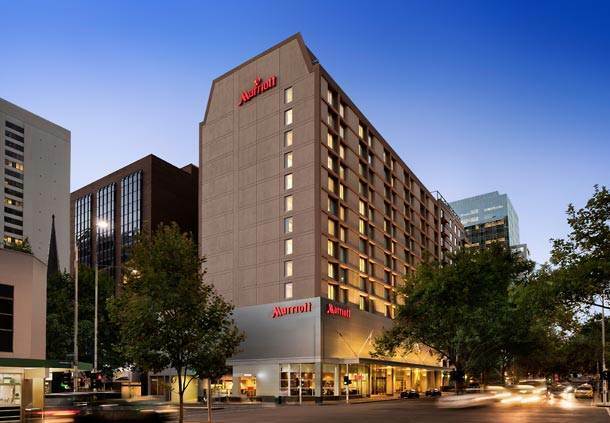 As one of the few hotels with a fiber optic backbone, Melbourne Marriott offered high speed wireless and facilitates for faster data acquisition in the room. Marriott's signature and standardised bedding across all properties also meant there was no difference in the sleep comfort of my bed in Warsaw and Melbourne. Melbourne Marriott is one of the most competitively priced and affordable deluxe-class hotels in the city. The hotel continues to offer stays at great reduce rates from AUD199 per night from 16 December 2012 to 13 January 2013 (excluding 31 December) to help travellers enjoy the most of Summer. Staying in the Melbourne Marriott with its comprehensive in-house facilities and location on the corner of Lonsdale and Exhibition street means easy access to meetings, dining, entertainment and shopping in the city. Exhibition and adjoining Collins Street houses most of the major corporate offices, some of which use the function facilities at Melbourne Marriott for conferences and year-end parties. When not in meetings or the office, the revitalised executive lounge provides a cosy space to work and relax with refreshments available all day. A selection of hot and cold items and alcoholic beverages in the evenings provide a light and quick meal for busy executives. The hotel also installed additional washroom facilities in the lounge so early-arriving executive level guests will have access to showers and restrooms prior to check in. I particularly enjoyed the generous take-away coffee convenience which is missing in many executive lounges. I traded my Polish pierogi in Radio Cafe for a delicious seafood stack and chocolate fondant by Chef Clinton from the Essence on Exhibition restaurant. Chef Clinton has also designed a generous Christmas Day Lunch Buffet as a point of difference to the other Xmas offerings in the city. While the doughnuts won't measure up to Warsaw's A. Blikle's (and sadly most won't now that I've tasted one of the best), barister Alfredo makes a proper cup of java at the Espresso Bar. Every Friday, the Elements Lounge offer tap beers and house wines with canapés for AUD5 from 5pm to 7pm. In addition to Essence on Exhibition, a short walk in all 4 directions offer popular eats including classic French PM24, all day-dining at Cumulus Inc, Miss Chu's Vietnamese rice paper rolls, Longrain and Crazy Wings in Chinatown and rustic Italian at Carlton Espresso in Little Italy. A few minutes down Exhibition into Bourke Street and you're at the Myers, David Jones, Christmas lights of Bourke Street Mall. Further down is City Square, the hub of Melbourne's many festivals including the Melbourne Spring Fashion Week and Christmas Festival. A leisurely walk up Exhibition into Victoria Street will take you to the famous Queen Victoria Market with its popular Summer Suzuki Night Market and the quirky Brunswick Street of Fitzroy. Art in galleries, museums and streets are all around the hotel. An on-site fitness centre featuring cardio and weight equipment, and an indoor/outdoor connecting pool provides easy access to exercise or chill out by the pool with the family and kids. It was interesting to learn that the Melbourne Marriott property was the first five-star hotel in Melbourne in its previous life as Rockman's Regency. It came under Marriott management 10 years ago. It seemed apt that the owners and managers decided to honour the heritage of Melbourne by blending the old and the new into the new design. One of the nice touches added to the new look of Melbourne Marriott are the photographs of Melbourne in the 1950s. You can find yester-year scenes of Collin Street, the old Melbourne trams and landmarks framed and hung throughout the public areas of the hotel as well as the rooms. Even the carpet in the guest rooms contain grid lines that represent the Melbourne CBD grid. The little touches of history also transcend into long serving staff including an executive secretary and executive housekeeper who has been working in the hotel for 23 years, and a night manager for 30 years. In addition to recognising the extended service of its people, Melbourne Marriott also gives back to the local community through various activities including Zoos Victoria's art project 'Mali in the City' and a donation of AUD50,000 to the Clown Doctors through its 'You Eat, We Give' program. It's nice to stay in an hotel that cares for the community, its people and the guests.